Hello, Miss Veda. It was so nice to spend time with you and your parents during your newborn photography session. Veda’s mom got in touch with me a few months before she arrived because they wanted something extra special from their newborn photographer. 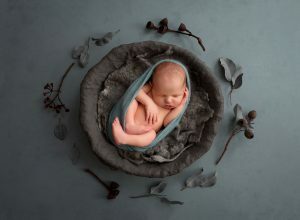 Wonderfully colorful newborn photos and some fun photographs too! I do hope you like what I’ve created for her family. They were an absolute delight to work with. Mom and Dad plan on reading this entire series to her one day. I’ve done the same with my little ones and it was so much fun watching their little minds wonder at the magic in the stories. Veda was born at the beginning of fall, so I created this photograph in the spirit of the season. Veda’s mom was so so beautiful and content with her newborn daughter in her arms. This adorable smile made us all laugh and will soon be displayed on top of a beautiful legacy box which holds all of Veda’s colorful newborn photographs. Sleeping so sweetly on a bed in this field of flowers, Veda couldn’t be any more beautiful. I always make sure to capture the simple poses of a newborn as well, focusing only on their perfect little features. Little Veda fits so perfectly in Daddy’s hands and is so tiny across his chest. One day, he’ll hold those small hands as he walks her to school and then eventually down the aisle. Wrapped up like a tiny potato, Veda slumbered so peaceful in this lavender colored swaddle. Mom and Dad both loved this “fresh picked” photograph that I have created in the past. So, I made sure to take a photograph that would blend perfectly and create the same image for their family. Using the veil from her parents wedding, which weighs so much, we tucked Veda in to make this gorgeous photograph. Their love and union has created her and will keep her wrapped up and protected. And finally, their first family portrait as a family of three! Aren’t they just lovely.